As someone coming from a country that knows very cold winters I love wool and consider wool socks a must-have item from October onward. I’m especially a big fan of merino wool. It’s so soft that it can be comfortably worn directly against skin. It keeps you very warm yet protects you from overheating because it breathes so well. It absorbs water yet retains warmth despite being damp. And thanks to the high lanolin content the wool even has antibacterial properties. It’s no surprise that merino wool has become popular for making high-end performance athletic wear! So it should come as no surprise that, when approached by the Danish company LANACAre, known for their wool baby clothes made from organic, untreated merino wool, I just couldn’t say no to the offer to try out some of their products. With colder temperatures setting in all over the Northern hemisphere, let me show you some of the wool baby clothes that we tested and fell in love with. Disclaimer: we received free samples of LANACare wool baby clothes in exchange for writing a review on Let the Journey Begin. All views are our own. Bamm-Bamm was born in May but it didn’t stop me from dressing him in this cute little wool hat quite frequently. It’s perfect for protecting those newborn ears against North German winds. We might need to get another, bigger one for the upcoming winter weather! There is something so sweet about dressing tiny baby feet in little booties, wouldn’t you agree? I’m a little sad that we didn’t get to use these more, they’re so soft that you could even put them on naked feet and the ties ensure that the socks stay put at all times. These pants are definitely among my favorite baby clothing items ever. They are warm, made with slightly felted wool for extra durability, and the legs are fairly wide to allow for freedom of movement. 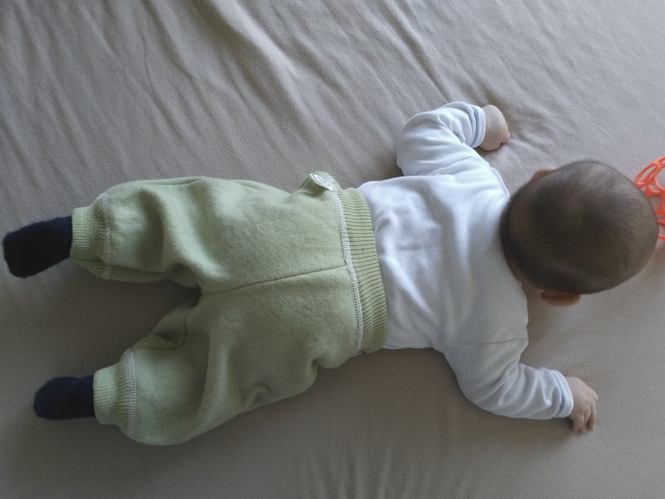 The best part is the adjustable waistband (see photo below) which means that, despite being the size 0-3 months, Bamm-Bamm can still wear the pants comfortably at the age of 5 months. What I love about the LANACare products that we tested is the attention to detail. The merino wool is super soft, the pastel colors are pretty and natural, and the clothes are visibly high quality. Furthermore, as you can see in the photos, all the seams and labels are on the outside. This little detail is genius and makes the clothes as comfortable as possible for wearing on naked baby skin, there is zero scratchy stuff on the inside! If you’re gearing up for the upcoming colder temperatures we can wholeheartedly recommend the wool baby clothes from LANACare.